Taipei's Guanghua markets — and its newly-opened Syntrend mall — offer up a frenetic tech-buying experience unlike any other. 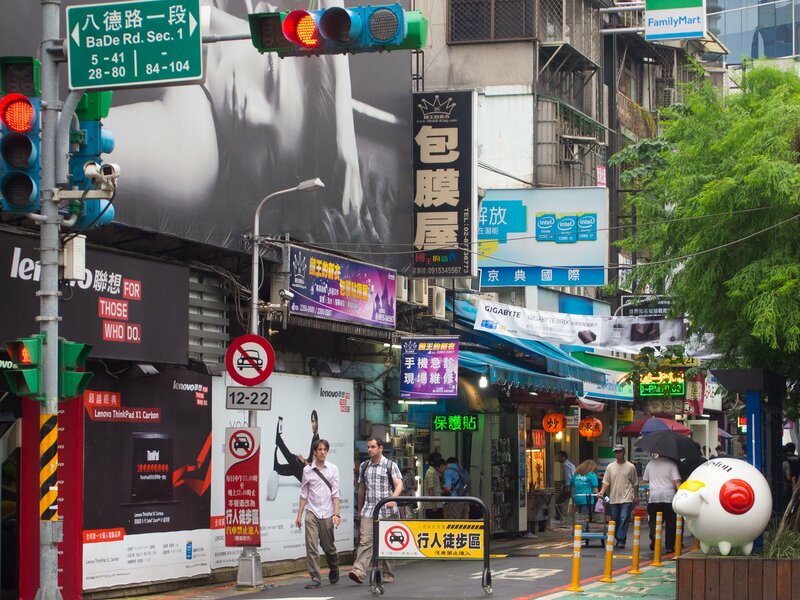 More than most cities, Taipei is big on technology. The Taiwanese capital is home to major global tech brands like ASUS and D-Link, with the likes of Acer, HTC and Foxconn headquartered close by in neighboring New Taipei City. It's also home to a big competitive gaming scene, and no end of outlets stocking the latest mobile gadgets. 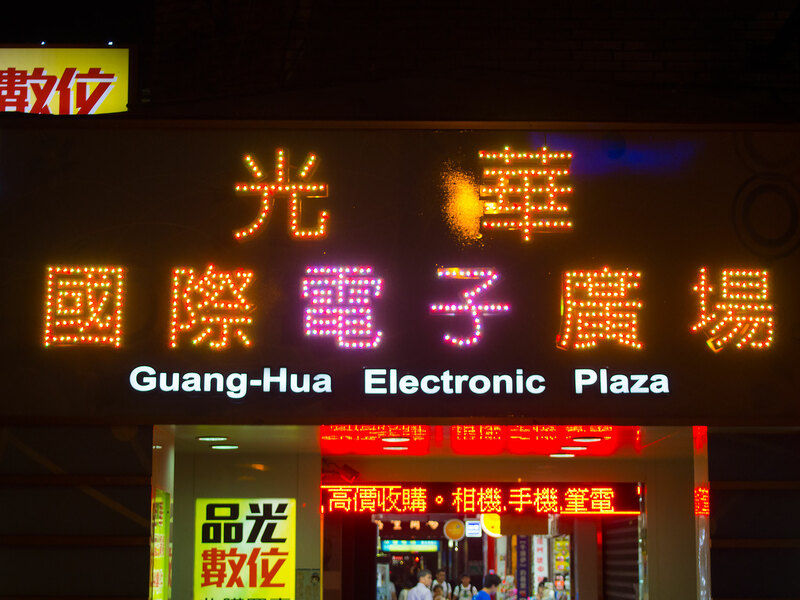 For decades, the sprawling Guanghua market has been the go-to location for consumer electronics in Taipei. In recent years it's been joined by the Guanghua Digital Plaza, and in the past month by the new Syntrend Creative Park. From bustling outdoor marketplaces to polished multi-storey malls, with dedicated stores for most major brands, it's a tech shopping experience like no other. Join us after the break for a guided tour. Winding outwards from the indoor Guanghua Digital Plaza, Guanghua Market presents a maze of gadget and technology stores from some of Asia's — and the world's — biggest brands. But it's presented unlike anything you'd find at your local mall back in the U.S. Dozens of tiny stores for major names like ASUS, HTC, Acer and Lenovo are packed into these streets and alleyways, right alongside more traditional market stalls. The selection can be overwhelming, but you never have far to walk before you've arrived at yet another outlet bearing the branding of a major name in consumer electronics. That's in addition to smaller independent sellers set up in the streets alongside them. The whole scene is set against a background of restaurants, street food vendors and often cacophonous advertising. You'll just as soon run into an HTC store as a 7-11. You'll just as soon run into an HTC store, or an outlet casually selling stacks of high-end gaming hardware, as you are a 7-11. Off in the distance in the shot below can be seen the newer Syntrend Creative Park, an ultra-modern counterpoint to the market's hustle and bustle. Just like the famous Shilin Night Market, all that technology is sandwiched between a broad selection of Taiwanese street food. Elsewhere, on the main streets, store fronts and billboards compete for attention against a vibrant, if occasionally dilapidated backdrop. Most of the market stores themselves are fairly small, presenting a small cross-section of each manufacturer's product line. This Sony store was packed with camera gear, headphones, phone accessories and of course smartphones. Sony's still promoting the Xperia Z3 in Taiwan, with no sign of the newer Xperia Z4 in any of the stores we visited. Across the street, another store is draped in the branding of Lenovo, the world's biggest PC maker, based on the Chinese mainland. If there's one constant to point out, it might be Samsung's many experience stores throughout Taipei. Samsung's Taiwanese outlets are pushing different products — the Galaxy A smartphones and Galaxy Tab A tablets, in addition to the GS6 series — but the overall look and feel of its stores is familiar wherever you're coming from. The big Taiwanese tech brands dominate, with prominent placement given to the likes of ASUS and Acer. There's a whole lot of ASUS going on, though. And the same is true of the other Taiwanese tech giants like Acer and HTC. ASUS in particular is all over the place. Ads for the recently launched ZenFone 2, as well as its Republic of Gamers-branded gaming gear, are a regular sight. Gaming is also big business, and PC gaming accessory maker Razer has several authorized resellers set up at Guanghua market — again, against a backdrop of traditional restaurants and other market stalls. PC gaming hardware stores are common too, often with a repair business tagged on. So it's common to see PC towers stacked up, entrails exposed, alongside piles of the latest graphics cards from NVIDIA and others. The market also houses a curious collection of digital relics. But it's not only about the latest technology. The fast-paced nature of things means relics from previous generations of hardware are often left behind. We ran into a few such digital antiques — an ASUS Padfone model from way back in 2013, and what we were informed was the last LTE Nexus 7 in stock (erroneously labeled as "Intel Inside", and ours for NT$5,500, around $175). Nearby, a lonely Core 2 Duo ad stood neglected by a utility box. HTC is another brand that's pretty big in smartphones in the West, but absolutely huge in its home country. At Guanghua market and the neighboring malls there's no shortage of HTC stores stocking new flagships like the M9, as well as Asia-only phones like M9+, E9+ and Butterfly series. But HTC's popularity in Taiwan has spawned a curious offshoot at at least one Taipei's many HTC stores. This one offers not just an HTC shop and service center, but also an HTC cafe, where you can enjoy your beverage of choice alongside Wifi, power and an unusual collection of HTC memorabilia. The menu from the HTC Cafe. A latte will set you back NT$100 (around $3.20). The walls are lined with HTC phones, accessories and often bizarrely specific branded swag. Do you know someone who'd just love a Michael Jackson The Immortal by Cirque du Soleil HTC One M7 hard shell case? They're available in both red and black! Of course your beverage is served in an HTC mug — this one displaying a vintage HTC handset. Can you name this HTC phone? We must've arrived on a quiet day. There was only one other patron at the HTC Cafe, and he was using an iPhone 6. Elsewhere, there's a video projector set up, mirroring a HTC promo video from a nearby phone. This HTC VIP program was advertised in many of the HTC stores, offering access to special HTC events and after-sales care for phones. The rest of the store was a somewhat surreal experience — lots of old HTC branding and slightly outdated products in display cases that hadn't been touched for a while. (This store, for instance, was still stocking Beats accessories. Had they not heard the news?) A metaphor, perhaps, for the current difficulties faced by the once-dominant Android phone maker. Downstairs is where the newer, flashier HTC phones and accessories are displayed, including the Desire 826 and RE camera. And we also ran into a couple of phones that'll likely never make it to the U.S. or Europe — the HTC One M9+ and E9+. The M9+ is a slightly bigger version of the M9, with a 5.2-inch screen at Quad HD resolution, and an octa-core MediaTek CPU running the show. It's also rocking a front-mounted fingerprint scanner that doubles as a home button, if you want. And around the back you'll find an M8-style depth-sensing Duo camera. The E9+ packs the M9+'s internals into a more affordable 5.5-inch all-plastic enclosure, minus the fingerprint scanner and Duo camera. It's a nice device in its own right, selling for around NT$15,900 (around $510) in most places. Guanghua market doesn't stop after the sun goes down. Most outlets continue to operate well into the evening. And as the night goes on the marketplace erupts into a sea of neon. The marketplace is just as busy after dark — if not more so. There's never a bad time to be on the lookout for a new smartphone, tablet, gaming PC or accessory. Taipei gets extremely hot and humid during the summer months, and it doesn't get much cooler at night. The area's tropical climate means there's often a lot of bugs flying around at night. Combine that with a bunch of illuminated, open shop fronts and — well, you get the idea. Shop staff sometimes have to fend off an influx of flying beasties, attracted to the light of their electronics. The Guanghua Digital Plaza is the outdoor market taken to its logical conclusion: a vast indoor space with no end of gadgetry on offer — albeit set against a more drab concrete exterior. A similar selection of outlets, including some more "prosumer" focused brands like Wacom. The ground floor of the Digital Plaza is actually just one big showroom. If you want to buy any of the stuff you see, you'd need to head upstairs. Once again, the entire showroom floor is dominated by the big Taiwanese names like MSI, ASUS and Acer. 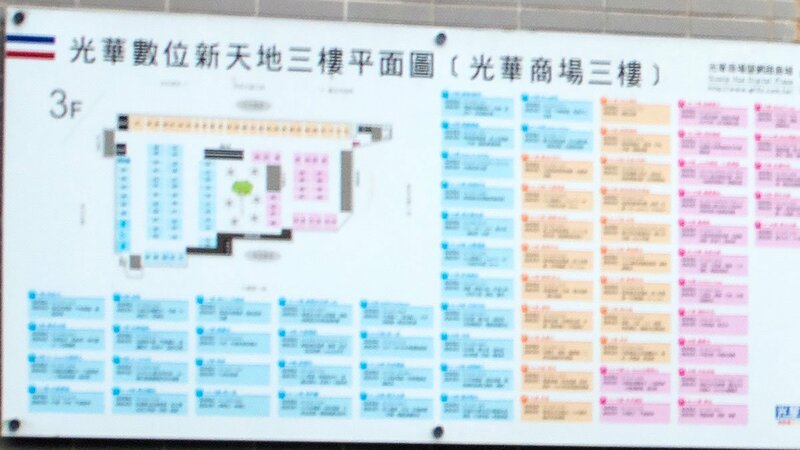 There are six floors of showrooms and tiny electronics outlets crammed into Guanghua Digital Plaza, and the floor plan on the right should give an idea of the sheer volume of shops packed within this one building. This is just one floor. The indoor Digital Plaza might lack the character of the marketplace outside, but there's no denying the sheet selection of technology on offer. Syntrend has one foot planted firmly in the future. The new Syntrend Creative Park, opened in the past month, is operated by Foxconn and spans twelve floors. It's a far cry from the ramshackle outdoor marketplace. And while it's not much to look at from the outside, the interior is an ultra-modern mall home to the latest consumer electronics, and some of the biggest global brands. Unsurprisingly, HTC is represented here, as are big gaming hardware names like Gigabyte and MSI, and mobile operators Chunghwa Telecom, FarEasTone and Taiwan Mobile. Syntrend's carrier stores showcase some of the biggest phones of the moment, with a bit of local flavor. You never need to go far to find an HTC or ASUS flagship, including the very latest devices like the ZenFone 2 and HTC One E9+. We were also surprised to find LG's cutesy (or creepy?) AKA phone, complete with slide-up plastic case and characteristic eyes. Chinese manufacturer Oppo also has a presence at the new mall, showcasing its super-thin R5 handset. How thin is it? It needs a special adapter for headphones, because it's too slim for the regular 3.5mm jack. Oppo was one of many gadget makers running promotions and competitions at Syntrend during our visit. Chip giant Intel has a huge presence at the new Syntrend complex, showing off a wide variety of tech. PC gaming is big in Taipei, and multi-screen gaming setups are common in many of the big players' retail stores. Not to be outdone by the likes of MSI, Intel has its own high-powered, three-screen gaming rig, complete with racing wheel and a fourth screen showing the leaderboard. Punchcards are back, as intel combines projection and IR cameras in an impressive tech demo. Intel also had a range of intriguing technical showcases set up, including this one, which combines infrared sensors on the ceiling with a projected table interface. By combining these two, Intel's demo rig can be controlled using a number of command cards — select elements on the periodic table by pressing a punched hole on the card, control video using printed play and pause keys, or view intel chips at their real size on another card. Intel also had its own 3D capture and printing equipment set up. The company's RealSense 3D camera would first capture a high-res model of an object, before passing that to a 3D printer for duplication. The process is slow and finicky, but impressive all the same. Guarded by Bugdroids and packed with Googley gadgets. The "Newtrend" store on Syntrend's ground floor is Taiwan's first Android store, dedicated to the products that make up Google's ecosystem. We're talking everything from phones to tablets to smartwatches to Chromebooks. Look closely and you'll even spot a drone or two. To hammer home the Google-centric message, shoppers are greeted by two giant Bugdroids at the door. Like other phone stores in Taipei, the balance of devices favors local manufacturers like ASUS and HTC. It's not just Android, though, Newtrend also stocks a selection of Chromebooks and Chrome OS-powered all-in-ones from various manufacturers. A sign at the entrance tells shoppers that the Nexus 9 LTE is now available in-store. Intel wasn't only company showing 3D printing technology at Syntrend. A dedicated area on the second floor shows thing-makers from various companies, including some that were already in the middle of spewing forth their creations. There was no pricing on these specific models, but as we know 3D printing isn't cheap. High-end peripheral maker Razer is one of the biggest names in gaming accessories, and has a sizeable spot carved out at the Syntrend mall, selling not just headphones, mouses, keyboards and (glowing) mousemats, but also hosting PC gaming events and competitions. There's also a selection of Razer swag to choose from. And this is Razer's trippy "Firefly" gaming mousemat, which can rotate through 16.8 million different colors. Not enough neon lighting around your whole desk area? The technicolor beast above sells for around $60. There's no shortage of ASUS stores in Taipei, but the biggest retail presence we saw for the Taiwanese tech giant was at Syntrend Creative Park, where an Apple-style open plan store showcased ASUS' entire range of products across smartphones, tablets, notebooks, gaming, entertainment and wearables. The store is stocked with accessories for just about every ASUS product you could think of, and there's a section dedicated to its ROG (Republic of Gamers) PCs as well. The store's centerpiece tells the design story of the ASUS ZenWatch, with models showing each stage of the design from inception to the finished product. And should you wish to actually buy a ZenWatch, ASUS is more than willing to accommodate you. The original ZenWatch is sure to be joined by its big brother, the ZenWatch 2 in short order. For more on the second-gen ASUS wearable, check out our hands-on coverage from Computex 2015. MORE: Check out our hands-on with ASUS' new ZenWatch 2! There are currently no Apple-operated Apple Stores in Taiwan, but there is a multitude of official Apple-authorized resellers, most of which do their best to emulate the first-party Apple Store experience. The largest of these that we came across was "Youth," located close to Guanghua market. But there are plenty of others, both official and unofficial. "LW" inside Guanghua Digital Plaza is another smaller outlet that's kinda like an Apple Store, if you squint. Then there's "Apple Plus" at Guanghua market which looks more like a shop that just happens to sell Apple stuff. The interior of "Youth." With the exception of the dedicated sales counter and lack of blue shirts, you could just about be inside any Apple-operated store. Outside of the Apple-licensed channels, there's no shortage of shops at Guanghua market that'll sell you Apple products — including the Apple Watch, which wasn't officially available in Taiwan at the time of our visit. Your grey import Apple Watch will cost you though — prices readily exceeded NT$20,000 ($650) even for the less expensive models. After an unofficial iPhone color from very unofficial sources? Market sellers have you covered. And the legend of Steve Jobs lives on, even in a marketplace dominated by Android and Windows devices. We spotted this slightly battered figurine looking out from a market seller's display case. You can't escape from Hello Kitty. The Japanese animated feline is a common sight throughout Taipei. Dedicated fans can even fly into the city on a plane brandishing the cartoon cat's familiar visage. If it exists, chances are you can find a Hello Kitty version of it, and you can bet your adorable pink bow and whiskers that extends to phones and tablets too. Take in the view with this Hello Kitty point-and-shoot camera. Blog about your trip on this cat-faced PC. 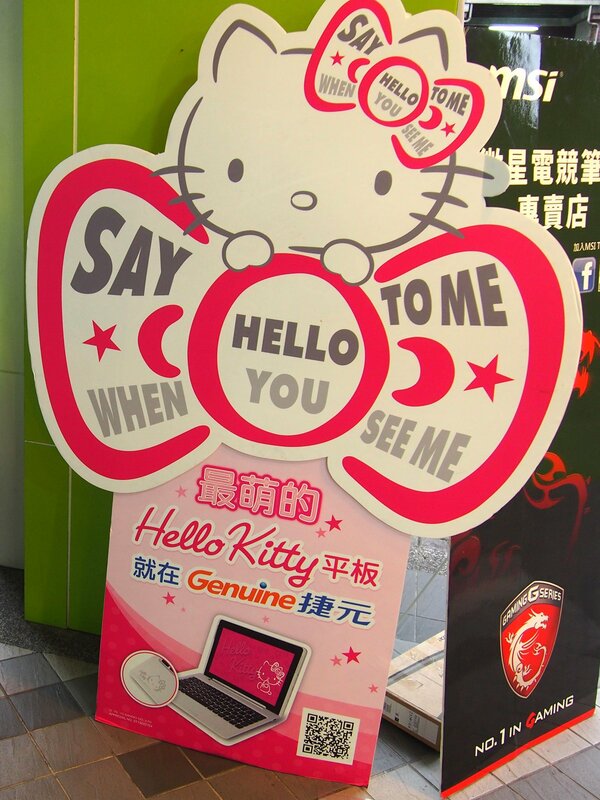 Or maybe a Hello Kitty Windows tablet is more your style. A walk down the street in the tech market areas of Taipei is punctuated by constant reminders of the cat's existence. Say Hello To Me When You See Me. 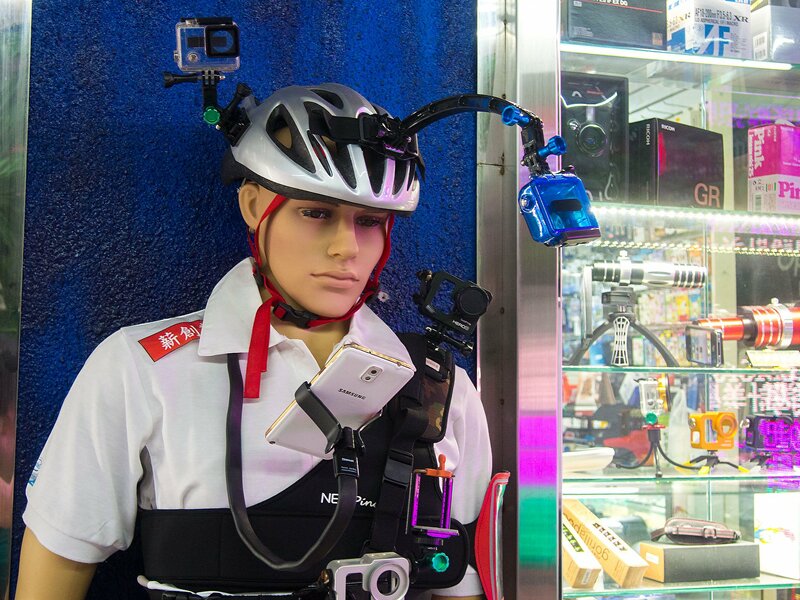 It seems like there's no end of gadgets on offer at Guanghua's street-level markets, the Digital Plaza and the new Syntrend Creative Park, to say nothing of the rest of Taipei. Like the gentleman above, we feel like we've got so many gadgets to see, and not enough time in which to look. Needless to say, if you find yourself in Taipei, you'll definitely want to check out this sprawling technology marketplace. Head over to Android Central's Instagram feed for more from this series. And be sure to let us know in the comments if you'd like to see more photo essays from the cities that host the tech world's biggest events. If you've missed any of our coverage from Computex 2015 in Taipei this past couple weeks, hit the link below to catch up on all the news!